Could we fit more Extra Life news into one title? Ok, so Extra Life didn't quite make it to space, but it got pretty close. 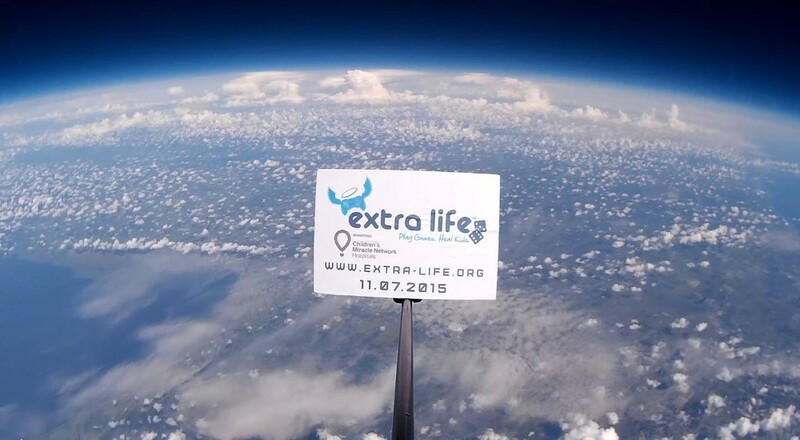 A small group called Stratosphere Adventures sent a balloon to the edge of space carrying a message to promote Extra Life. They captured an incredible view hoping to inspire gamers to join Extra Life or make a donation. Check out the video they put together below. As you can see in the video, the Extra Life 24 hour marathon takes place on November 7th this year. As in years past, we have created a team, and we would love to have you as a team member. If you're interested in joining, head on over to our team page and click "Join Our Team" to register. Once you're all set, I'll contact you and get you up to speed. Everyone is welcome to join our team, even if you can't participate in the entire marathon. If you'd like to donate, you can do that from our team page as well. Speaking of donations, for a limited time, if you donate $6 or more to Extra Life, you'll automatically receive access to the Rainbow Six: Siege beta which starts on September 24th. There's no word on whether or not the beta contains co-op, but that's still a really nice incentive to donate to a great cause, as if saving a kid's life wasn't enough. Finally, Humble Bundle is currently offering a Humble Game Making Bundle, which benefits Extra Life. The bundle has a bunch of great resources to help you make that awesome co-op game you've always dreamed of making. Some of the Humble Bundle proceeds contribute to the Indie Game Making Contest prize pool, which you could win for yourself with the game you make after purchasing this Humble Bundle. Sounds cool right? Head on over to Humble Bundle and grab your Game Making Bundle. Page created in 0.3352 seconds.